Mercedes-Benz V-Class Performance, Engine, Ride, Handling | What Car? 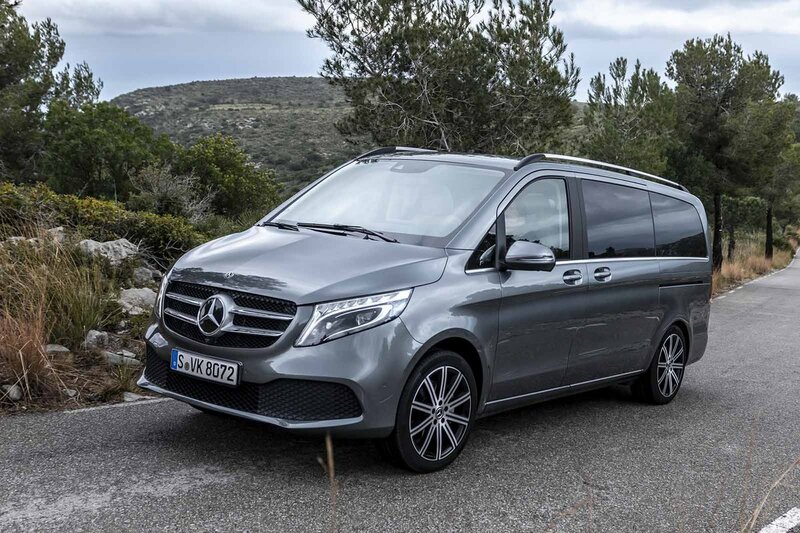 The V-Class is based on the Vito van, and its commercial vehicle underpinnings are made evident right from the off by the somewhat rudimentary way it rides. Even with the adaptive dampers that come as standard on UK models, it bounces along on undulating roads and, if you hit a hefty bump or ridge at any speed, a resounding shudder will echo through the cabin. It falls a long way behind the comfort offered by regular MPVs such as the Ford Galaxy, while even the similarly van-based Peugeot Traveller manages to do better. The same is true of handling. Bar the Galaxy, none of these large MPVs feel particularly agile, granted. Yet, with low-witted steering and a hefty amount of body lean through corners, the V-Class lives firmly in the shadow of rivals including the Seat Alhambra, and, again, even the Traveller. Another area in which the V-Class lags behind its purpose-designed MPV rivals is refinement. Wind and road noise are reasonably well checked, but you get lots of suspension noise over broken surfaces. The new 2.0-litre diesel engines are pretty quiet unless you work them hard but, overall, the Ford Galaxy is a far more relaxing car to travel in. At least the V-Class’s engines give good performance. Even the entry-level 220d is up to the job and pulls well from low revs, but if you are regularly filling all those seats we’d suggest you plump for the more powerful 300d. Its extra shove not only helps it feel relatively brisk, but it’s also quieter – not having to rev it so hard to make progress tempers the engine noise. Both engines come with a nine-speed automatic gearbox, and this works well, producing slick shifts. The Marco Polo versions have the same suspension and engine set-ups, but all the additional fitments inside bring a hefty chunk of extra weight. This serves to provide a somewhat more settled ride at a motorway cruise, but makes the V-Class feel even more cumbersome along twisting roads. You’ll definitely prefer to gently shuffle from one picturesque campsite to another, rather than hot-foot it between them.